Padraig Pearse was born in 1879, the second of four children to James & Margaret Pearse. His father was a stone mason, and his mother’s family had survived An Gorta Mor, the great famine in 1846, leaving Co. Meath, for Dublin. Padraig Pearse , was an educator, taking great pride in Irish history, and language. He was, from his earliest days, a person who wanted a free Ireland. 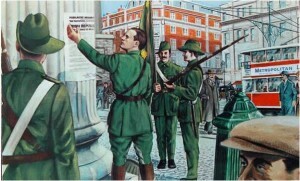 As such, Padraig Pearse was a key leader in the Easter Rising of 24-29 April, 1916. On Easter Monday, April 24, 1916 it was Padraig Pearse who read aloud, Poblacht na h-Eireann, (To the people of Ireland), the Irish Declaration of Independence, at the General Post Office. After 6 days of heavy fighting, and increasing civilian casualties as well as great property destruction, Pearse issued an unconditional surrender to British forces. Padraig, his brother Willie, and thirteen other leaders of the Rising, were held in Kilmainham Gaol, court-martialled and then executed by firing squad. On the morning of 3 May, 1916, Pearse, Thomas MacDonagh, & Thomas Clarke were the first of the rebels to be shot. Pearse is buried at Arbour Hill Cemetery, in Dublin.